Those who don’t have an iPhone, wouldn’t be so bad except that you can’t send iMessage from your Mac. When Apple has introduced iMessage, it meant that you now don’t worry about how many text messages you have gone through and so long as the person you were messaging had an iPhone. With the latest updates of iOS 8 and OS X Yosemite, Apple has decided to share with the non-iPhone people by adding the new feature to the OS X Yosemite and the latest iOS allows you to type a message in OS X’s messages app and have it to be relayed on your iPhone to send a message. Apple group this with their continuity features which lets you to continuously perform the activities between the Apple devices. 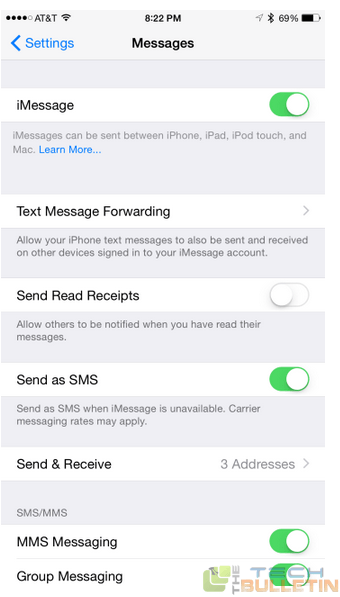 Here I explained clearly how to send texts from Mac using iOS 8. Tap on settings on your iPhone. Now you will see the list of devices which you want to send the text messages from your Mac computer. Tap on the switch and turn it on. Now you will get the box popping up asking you for the verification code. On your Mac PC you will see the pop up in the messages with the said code. Now enter that code on your iPhone and then click on allow. Now the switch for text message forwarding will be ON. Do this and have a try. Go into the messages on your Mac PC, here create a new message to anyone who doesn’t have an iPhone and watch what will happen. Now you can now send the text to the people who don’t have iPhones.